1. 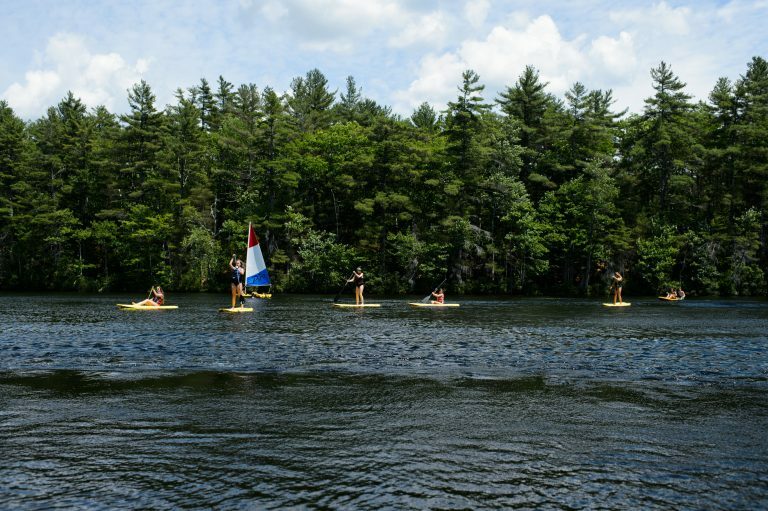 Get Away From It All: Camp North Star sits on 200 picturesque acres with a 55-acre private lake in Central Maine. You won’t find a more ideal location for a sleep away camp. In our beautiful setting, children experience nature, unplug from electronics and make real friends away from social media. 2. Flexible Scheduling: Families can choose from 2, 3, 4, 5 and 7 week options. In every session, campers enjoy all the benefits of a complete summer camp experience, including trips, camp-wide games and traditions, and special events. 3. Elective Program: Each week campers select their schedule with choices in Arts, Athletics, Enrichment, Outdoors and Waterfront. Campers love creating their own schedule from more than 100 exciting activities—our elective program features fabulous facilities and highly trained staff to help children achieve at their own pace. We also offer opportunities for academic enrichment and ESL at camp. 4. Core Values: At the foundation of our camp community is the RICHS. North Star’s value system teaches campers about Respect, Independence, Caring, Honor and Spirit. Campers are excited to practice the RICHS every day, and alumni tell us that receiving recognition for the RICHS was among the highlights of their Camp North Star experience. 5. 21st Century Life Skills: We actively teach and promote the essential life skills of collaboration, communication, critical thinking and creativity. Campers discover and develop the best version of themselves when they learn to practice 21st century life skills—and research shows that collaboration, communication, critical thinking and creativity help children succeed in school and workplaces. 6. Friends: One of our most important goals is to teach our campers how to form and maintain long-lasting friendships. We are proud of our geographically diverse population of campers. Last summer, our campers were from 21 U.S. states and 14 foreign countries. 7. Family: Our campers and staff consider Camp North Star their summer home and extended family. 8. Camp Leadership: Camp North Star is family owned and operated by Steven and Brooke, who have made a lifelong career of youth development and summer camp. Their three children, Makayla, Heath, and Noah, enjoy being North Star campers. Steven proudly serves as Regional Vice-President of the American Camp Association (ACA), which has worked to promote safe summer camping and healthy youth development for more than 100 years. Camp North Star has passed over 300 quality standards to earn the ACA’s prestigious Seal of Accreditation, which exceeds federal and state guidelines for every aspect of summer camp operations. 9. Camp Staff: North Star’s directors, counselors, specialists and support staff are all handpicked because of their experience and commitment to being a positive role model to our campers. Many of our staff are former campers and have progressed though our Leadership Training and Counselor-in-Training programs. 10. Healthy Meals: Chef Steve ensures that our meals are delicious, nutritious and kid-friendly. We have a dedicated chef who prepares meals for all campers and staff with any food allergies or intolerances. You won’t find high fructose drinks, soda, candy or junk food on our menu. Instead we offer fresh fruit, an extensive salad bar with lean proteins, and entrees that are baked or grilled, not fried.